I was reading with disgust how Grimgriz, Me.1 and Imorg fixed that Lab building and figured I needed to do something about it. After cleaning up some blue beacons in Quantar space I headed to Eye of Roh station to get our “Boomer.” Then headed to QC to load up with Nukes — three on the racks and six in the hold. Imorg was on duty somewhere, so I offered him the opportunity to help me out to repent for his sins. But he was going on about “no proof it was a lab” and so forth. I think that boy is a little slow. So I headed out on my own to do some damage, fully expecting Imorg or Grimgriz to try to interdict. That did not happen so it was a long, boring run. I made three bombing runs, headed back to KH to reload, and then made 3 more. Unfortunately, it left me 2 nukes short of finishing off the building. I guess I’ll be back tomorrow. I logged-in to duty today and was surprised to find quite a few others on duty as well. As far as I can tell, the roids are still not cooling properly (although some did look to be a lighter shade of blue) and there are currently no faction or TRI missions. So I guess everyone was flux-hunting, hauling or pureing. I was just on to tune beacons. I did one run up through Ekoos and RV over to Tripoint. Then a run from Tripoint through Path of Hordes to QC. Then a last run from QC over to KH. Other than the number of people I saw on F5, nothing much exciting. I decided to support the new Quantar Faction Mission that was just launched. Mining ice. I launched from The Stone Temple (Ekoos) in my Khamsin –Mercenary tagged as I did not want to fly to QC to switch to civ. Hit a couple of ice roids in Ekoos and then a couple more in Ring View — but as I worked my way down toward Quantar Depot, all of the ice roids were already hot — so I wasn’t able to extract much more. Got about 135 units or ore in total — about 120 ice. That makes about 4 units of Magnesium. That’s just rough. And to heap insult upon injury, when I got to Depot, there was a problem with the mission computer. Being the impatient sort, I sold my ore anyway and at least got a Skill Star for my efforts. But FM credits and exp would have been nice. Maybe tomorrow. I had not been on duty in many weeks and had been getting the itch to fly. 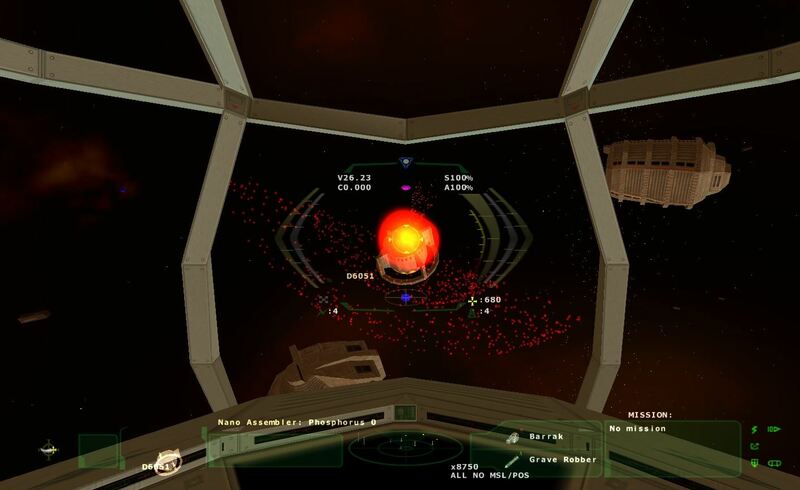 I launched from Stone Temple in my phoon and tuned the sectors surrounding Ekoos — and then headed to Quantar Core sector. Once there I headed to Eye of Roh HQ — Brother Tesrend’s station. I have not heard from him in several years and often wonder what happened. After The Catastrophe, once the gates were opened again, he seemed to be everywhere — fighting, fluxing, manufacturing, stocking . . . and then he just disappeared. So many have gone missing this way. At Eye of Roh HQ, I switched from my phoon to the Khamsin we keep there, ready to mine. I headed for Inner Roh Cloud for an hour of pureing, and was fortunate to easily find five different pure asteroids — a couple very large. Once the ship started getting too sluggish from the heavy antimony, indium, iridium and cobalt I had found, I headed back to QC Station to cash-in. Once the Paymaster had credited my account, I headed back Eye of Roh. I have to do this again soon. It felt good.